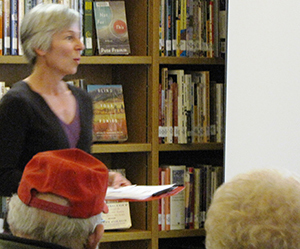 Wendy Campbell, the library director in the small town of Darby, Montana, who successfully organized a community discussion on Islam despite objections from some local residents, has been announced as the 2016 recipient of the Robert B. Downs Intellectual Freedom Award from the University of Illinois’ School of Information Sciences and the publishing imprint Libraries Unlimited. Campbell will officially receive the award at ALA’s Midwinter Meeting in Atlanta on January 21. As Campbell herself outlined in an April article for ALA’s American Libraries magazine, the Darby Community Public Library program “Perspectives on Islam” was presented in conjunction with a Montana Historical Society exhibit on immigration to the state that was on display in the library. Two other programs on Black homesteaders and Chinese immigrants in Montana were also offered without controversy, but the March 9 discussion on Islam led by University of Montana lecturer Samir Bitar attracted protests as soon as it was announced. Campbell calmly fielded calls and in-person complaints from those opposed to the program, including one resident who claimed that “all Muslims sought to kill us, and that we were at war with Islam.” As the opposition snowballed, Campbell realized that some extra planning would be required to ensure a safe evening for all attendees. Drawing on connections in the local community as well as a webinar from ALA’s Office for Intellectual Freedom, she invited the most vocal opponents to a preliminary meeting of the library board where they could voice their concerns. Libraries are vital to our communities as safe places for education and communication. This program is one of three in a series on historical and contemporary cultures. Tonight we learn of the culture of Islam. I will be honest with you that the culture is intrinsically tied to its religion, so you will also learn of this religion tonight. Libraries do not promote or condemn. We offer opportunities for education. It is a safe place where we come together for respectful and peaceful discourse. Please, when writing your questions for the speaker tonight, simply speak for yourself with questions to learn, not convince. Please make them brief so that we can hopefully answer most questions. I am thankful for this event tonight. I am thankful to live in this country. We live in the Land of the Free where we enjoy freedom of speech and the freedom to be educated in our topics of interest. And we are the Home of the Brave, where we are not afraid of different viewpoints or ideas. We welcome them so that we may be educated and make informed decisions. And we live in the West, in Montana, in Darby, where we are open and polite and welcoming to others. With that, I ask you to help me welcome our speaker tonight. At a time when libraries are seeking greater civic engagement, at a time when many of us are looking for more meaningful and dignified discourse, Campbell’s approach proved to be definitive: the speaker was welcomed warmly, listened to attentively, and questioned respectfully. By the conclusion of the event, the patrons gratefully applauded speaker and librarian alike. The library, meanwhile, secured its position in the community as a force for education that neither promoted nor condemned various ideas, but provided a safe and courteous forum for their consideration. Congratulations to Wendy Campbell especially, but also to the entire community of Darby for setting an example of respectful and diverse public discourse!